Sausages can form the basis of a good nutritious family dinner. Do not fall into the trap of considering them as part of a meal with chips and other fried food when they can be served with vegetables for a tasty supper, dinner or lunch. Try to buy the sausages that have higher meat content and less cereal and other additives. They may be more expensive but by adding other ingredients to the meal you need fewer sausages than you would if they were served with just mashed potato and beans. There are so many varieties of sausages made these days: pork and apple; lamb and mint; cracked black pepper and beef with stilton, are just a few. Traditional butchers will always have a good quality sausage on sale as well as an economy range to suit every purse. Preheat the oven to 200ºC or gas mark 6. Heat the oil and fry the onions and sausages until the sausages are just cooked and the onion is golden brown. Add the garlic as the onion starts to brown so that it does not burn. Meanwhile cover the lentils with water and simmer until soft. Remove from the heat and cut the sausages into two inch chunks. Replace in the pan and add the carrots, celery, sauce, tomatoes, peas, herbs and stock cube. Add the drained lentils and also the potatoes that have been cut into one inch chunks. Add water if the mix is too dry. Bring to the boil gradually and then put into an oven proof casserole dish with a lid. Place in the centre of the oven and cook for 40 minutes. Check to see if the vegetables are cooked. Add some gravy granules or a little mashed potato powder if you like your gravy thicker. Serve in a bowl with crusty bread to soak up the gravy. Some people prefer to have a can of baked beans in with their sausage casserole. If this is the case you can either replace to lentil or the can of tomatoes with the beans – or add it as an extra for an even more substantial meal. This is also a meal that would benefit from having dumplings served with it. If doing this take the lid off the oven proof dish fifteen minutes before the end of the cooking time and add the dumplings to the casserole. Turn them after ten minutes so that they do not become too hard on top in the oven. A pinch of chilli or herbs in the dumplings makes an interesting flavour. 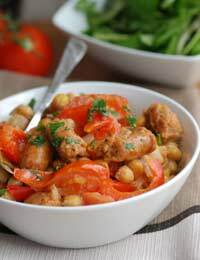 Check out some more tastysausage recipes.